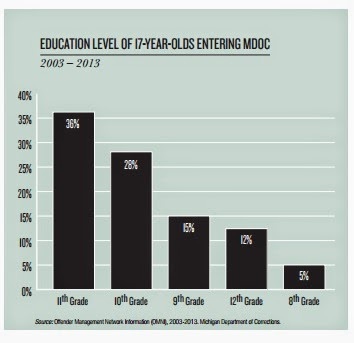 The data show for those youth 16 and under affected by Michigan’s transfer laws, most youth end up going to prison. Among the 11 to 16 year olds (yes, there appears to be 11 and 12 year olds tried as adults in Michigan), less than 10 percent are on probation. But among the 5,000 17 year olds who are still supervised by the Department of Corrections, a quarter of these youth are on probation (and another quarter are on parole). Put another way, nearly half of the youth who were 17 at the age of their offense are under community supervision. Does the fact that nearly half the 17 year olds are on probation or parole mean that prosecutors, defense attorneys and judges doing a “work around” Michigan’s laws that automatically see young people in the adult system at age 17? Are the relatively high numbers of youth on probation and parole an indicator that local stakeholders have read the research on what happens to kids when they are sent to adult prisons – that youth they are far more likely to reoffend, and come into harms ways – and are deciding to give these teens the least restrictive disposition available under the statute? Placing more 17-year-old youths on adult probation may be how progressive local system stakeholders are responding to the state statute, but this system adjustment does not solve Michigan’s challenge around having youth tried as adults, and the need to change the law. First, even youth on adult probation could have experienced pre-trial detention in Michigan’s jails – something that makes it more likely that a young person will experience violence and abuse. These young people – and our communities – will be dealing with the aftermath of their exposure to jail by creating a lifetime of trauma and reoffending. Second, even if a young person has been released from a jail and is now out in the community on adult probation and parole, they will still face the life-long consequences of an adult conviction. Having an adult conviction on a teen’s record can mean they will face barriers to finding housing, getting and keeping a job, and getting back into school. MCCD showed that when a young person is convicted in the adult system, they can expect to earn 40 percent less over their lifetime, which translates into a loss of tax revenue for communities throughout the person’s life. Third, while there have been promising advances in Michigan and around the country in adult community supervision practices, young people require a supervision approach that is tailored to their specific needs. A juvenile’s education, vocation, treatment, housing and family unification needs are simply different than those of adults. Michigan isn’t necessarily the only state using adult community supervision as a “work around” strategy for their transfer statutes to keep young people from experiencing the worst aspects of transfer to the adult system. Oregon, New York and Arizona have experimented with specialized adult probation or parole units that can buy treatment services from juvenile departments, and train officers to work with youth under adult jurisdiction. Of interest, the Michigan Prisoner Reentry Initiative, a model system developed nearly 10 years ago for adults’ discontinued youth specific approach for juveniles just last year, and there is no special re-entry designation for young people who enter the adult corrections system, and return to the community on parole. Most probation, parole and community supervision leaders that I work with would favor MCCD’s recommendation to raise the age of juvenile court jurisdiction to 18, along with a variety reforms that would improve supervision for all young people in the community. Jason is the research and policy director for JPI, and worked with juvenile justice and adult probation and parole departments in Oregon, and Washington, D.C. He served as a consultant to the community supervision division of the National Institute of Corrections, and wrote the white paper for Community Corrections Collaborative Network.